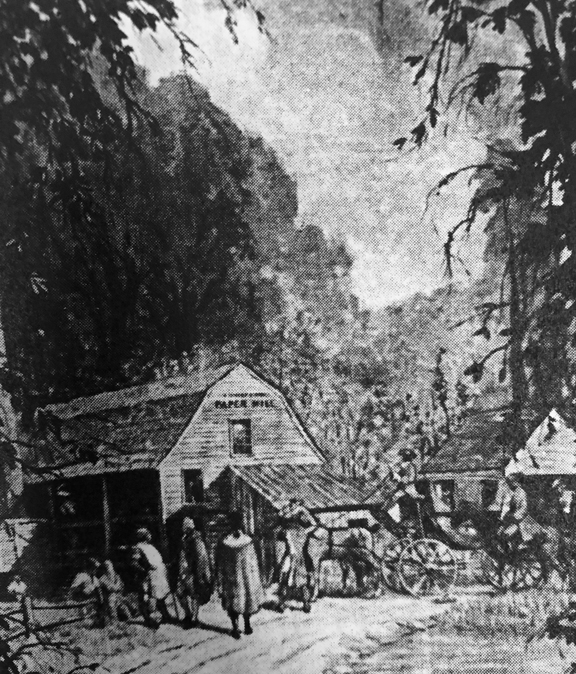 “George Washington Visiting Onderdonk,” detail from WPA mural, 1937. Although the phrase “sexual harassment” did not come into popular use until the mid-1970s, accusations of mistreatment and abuse by women against men of power have been part of the historical record for centuries. In November 1844, such a charge was brought against one of the most powerful men in New York, the Reverend Benjamin Tredwell Onderdonk, then Episcopal Bishop of New York. The scandal, trial, and media circus that ensued in New York no doubt rocked the Tredwell family’s world, for Bishop Onderdonk was a relative (first cousin once removed) of Seabury Tredwell. Hendrick Onderdonk’s son, Dr. John Onderdonk (1763-1832), was a distinguished physician in New York City for over 50 years, a vestryman of Trinity Church until his death, and at one time President of the Medical Society of New York. 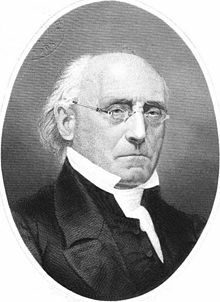 On July 15, 1791, his wife Deborah gave birth to a son, Benjamin Tredwell Onderdonk, who would go on to have an illustrious career in the Episcopal Church, until it was suddenly destroyed by scandal. Benjamin graduated from Columbia College in 1809 (his older brother, Henry Ustick Onderdonk (1789-1858), was a physician and churchman who became Assistant Bishop of Pennsylvania in 1827). Because there were no seminaries in the country at the time, he was trained for the ministry by his mentor and then-Bishop of New York, John Henry Hobart. 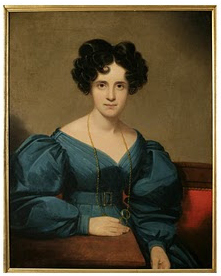 In 1813, he married Eliza Handy Moscrop (1793-1887); she bore him seven children. The family resided for many years at the Episcopal Residence at 106 Franklin Street, then (as now) considered a chic neighborhood in the city. After his ordination in 1815, at the age of 23, Bishop Onderdonk was appointed Assistant Minister at Trinity Parish in New York City. In the ensuing fifteen years, as he advanced his career in church administration, he earned a reputation for his superior knowledge of canonical law, his devout nature, his dedication to the poor, and his excellent managerial skills. His academic appointment was as Professor at the General Theological Seminary in what is now the Chelsea neighborhood. Upon the sudden death of his mentor, Bishop Hobart, in September 1830, Onderdonk was elected as his successor, becoming the Fourth Bishop of the Episcopal Diocese of New York. 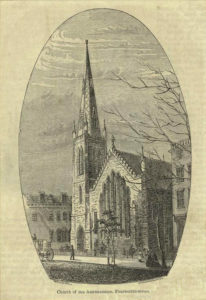 He was consecrated on November 26, 1830, in St. John’s Chapel on Varick Street. The Tredwells, who lived on Dey Street at the time, very likely were present to witness the bestowing of this prestigious honor upon their cousin. During his episcopate, Bishop Onderdonk established many new parishes, and supported missionary work in central and western New York State. Aware of the increasing disparity between the wealthy (who paid huge sums for the purchase of a pew) and the working poor, who by virtue of their poverty were excluded from worship, he spearheaded the creation of the Protestant Episcopal City Mission Society in 1831. The rapid growth of the Church in the state awakened the realization that one Bishop could not possibly supervise the entire Diocese; hence the formation of the Diocese of Western New York in 1838. Bishop Onderdonk officiated at the marriages, baptisms, and funerals of the elite in New York. On June 26, 1844, just months before he was embroiled in scandal, he officiated at the wedding of President Tyler and Miss Julia Gardiner at the Church of the Ascension on Fifth Avenue at 10th Street. The outcry against the Oxford Movement (and subsequently Bishop Onderdonk), reached its peak in 1843, when he supported the ordination of Arthur Carey, a shining star at the General Theological Seminary. 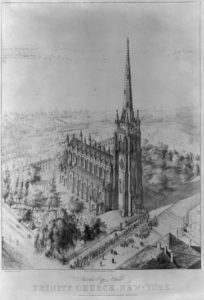 Despite objections from other Church leaders that Carey’s views were too sympathetic to Roman Catholicism, and ignoring the loudly voiced protestations of two rectors (Dr. Hugh Smith of St. Peter’s and Dr. Henry Anthon of St. Mark’s in the Bowery, who interrupted the ceremony by reading a formal protest aloud), on July 2, 1843, Bishop Onderdonk admitted Arthur Carey to the deaconate. As a result, a bitter assault was waged on Bishop Onderdonk in both the religious and secular press and in private meetings in New York. Meanwhile, unpleasant rumors began circulating – largely due to the efforts of Reverend James Richmond of Rhode Island (who himself often displayed, according to the Bishop, “erratic peculiarities,” and whose writing appears clearly to be the rumination of a troubled mind), that the Bishop was a drinker who had on more than one occasion acted indecently with women. The Bishop’s coarse manner and easy familiarity had often been remarked upon; it was a short hop from that to accusations of impropriety. Declaring, “I am going to Philadelphia to overthrow the Bishop of New York,” Richmond traveled to the convention on October 14, 1844, armed with affidavits signed by four women who claimed to be victims of Bishop Onderdonk’s indiscretions, and presented them at the General Convention held in Philadelphia. Auguste Edouart. 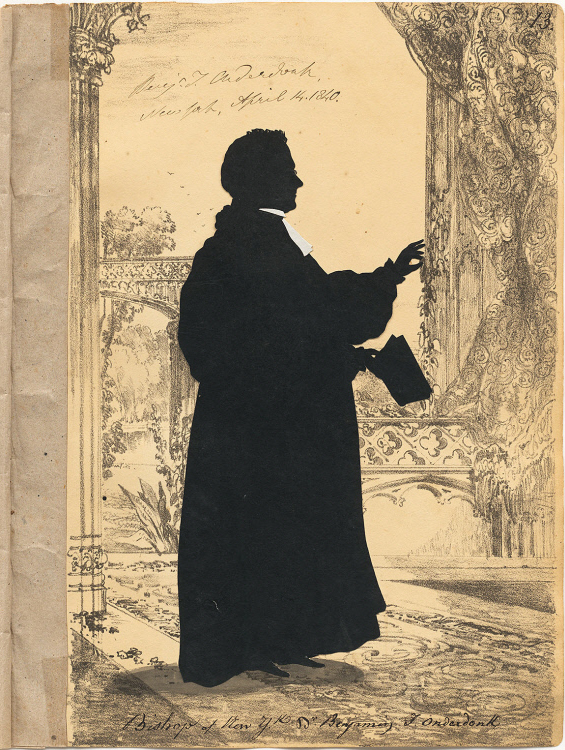 Silhouette of Bishop Onderdonk, 1840. National Portrait Gallery, Smithsonian. On November 7, 1844, after clergymen in Bishop Onderdonk’s own diocese of New York turned their backs on the charges that were made against him, three evangelical bishops from remote dioceses (William Meade of Virginia, Stephen Elliott, Jr. of Georgia, and James H. Otey of Tennessee) made formal charges against Bishop Onderdonk, accusing him of acts of “immorality and indecency.” The women involved, who were “virtuous and respectable ladies,” testified that the Bishop touched them inappropriately; his accusers stated that he “thrust his hands into her bosom,” and “‘impurely and unchastely’ passed his hand down and along the person and the legs of the said lady.” During one incident that supposedly took place in 1842, he “passed his hand in the most indecent manner down her body, so that nothing but the end of her corset-bone prevented his hand from being pressed upon the private parts of her body …” Bishop Onderdonk was said to be under the influence of “spirituous liquors” during several of the episodes. The incidents, which allegedly occurred between 1837 and 1842, took place while the Bishop was carrying out the duties of his office. The Reverend Samuel Seabury, a close friend, later stated that Bishop Onderdonk was “buried alive” by his own Church. 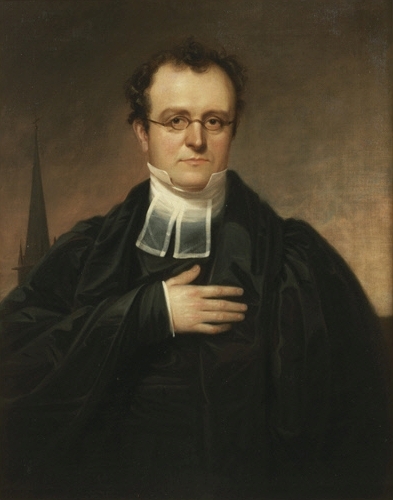 Bishop Benjamin Tredwell Onderdonk, by William Sidney Mount, ca. 1830-1833. NY-HS. 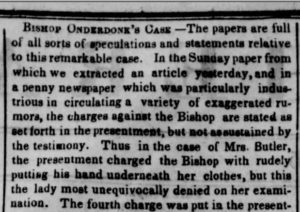 Bishop Onderdonk’s only rebuttal to the verdict came in the form of a pamphlet, published on January 15, 1845, in which he methodically refuted every charge made against him. New York Herald, January 7, 1845. 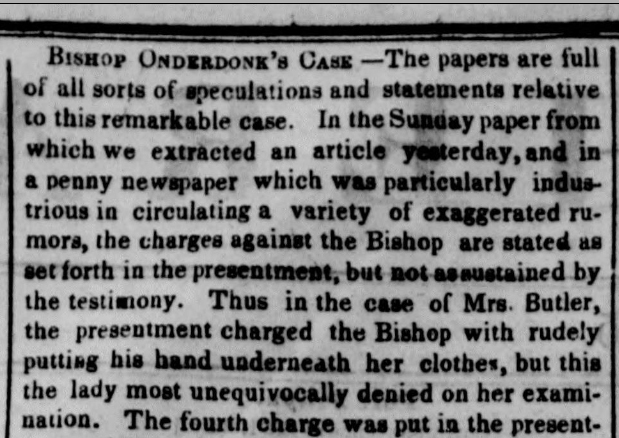 Because Bishop Onderdonk refused to resign, fearing that it would be interpreted as an admission of guilt, he was suspended indefinitely from the office of Bishop, and from all functions of the Sacred Ministry in the Episcopal Church. He was kept on salary, however, and paid $2,500 annually until his death. He also was permitted to receive Communion. Until 1852, the Diocese was governed by an Ecclesiastical Authority made up of the Standing Committee of the Church. That year, Mayhew Wainwright was elected Provisional Bishop of New York. The decision of the Court of Bishops was final. The Church had provided for no appeal; and although urged to appeal to a civil court, Bishop Onderdonk steadfastly refused, as he maintained that the ultimate authority in the case lay with the Church. How Did the Tredwells React? We have no record of how the Tredwells viewed the accusations, the public trial, and the subsequent disappearance of Bishop Onderdonk from the Episcopal community in New York City. Did they distance themselves from the scandal? One wonders if Bishop Onderdonk had been expected to officiate at the wedding of Elizabeth Tredwell and Effingham Nichols, which took place in April 1845. Having his cousin, the Bishop of New York, officiate at his daughter’s wedding would certainly have been a social coup for Seabury. The disastrous turn of events, however, barred the Bishop from performing church duties, including marriages; perhaps this is what led the Tredwells to ask Reverend Samuel Nichols, the father of the groom, to officiate at Elizabeth’s wedding. Following his public humiliation, Bishop Onderdonk lived in seclusion at his home on Franklin Street, and after 1859, at his home at 35 West 27th Street. He attended church daily and took Communion at the Church of the Annunciation, then located on West 14th Street, where his close friend, Dr. Samuel Seabury, was rector. He never publicly expressed bitterness towards his accusers. 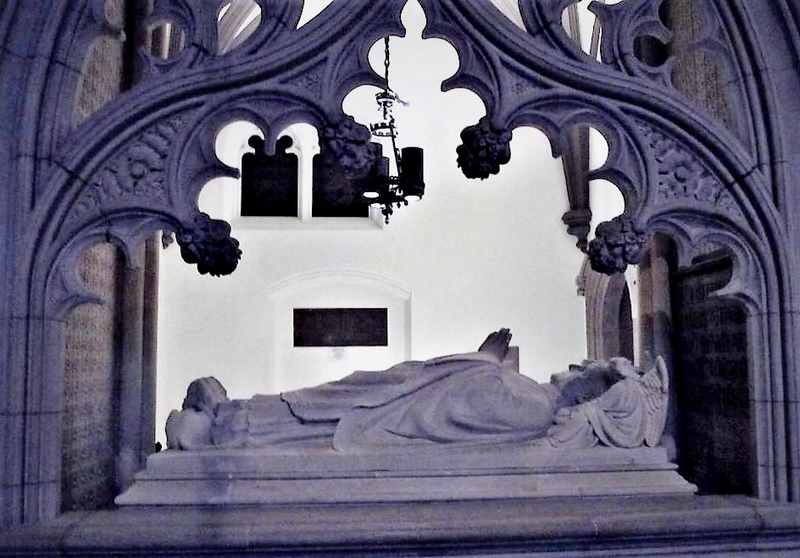 Bishop Onderdonk is buried within a stone sarcophagus at Trinity Church; it depicts him lying in repose, yet crushing a serpent – “Scandal” – beneath his heel. Sarcophagus of Bishop Benjamin Tredwell Onderdonk, Trinity Church. Chorley, E. Clowes. “Benjamin Tredwell Onderdonk, Fourth Bishop of New York.” Historical Magazine of the Protestant Episcopal Church. Historical Society of the Episcopal Church: Vol. IX, No. 1, March, 1940. https://www.jstor.org./stable/42968753. Accessed 10/30/18. Churchman’s Monthly Magazine. Vol 4, 1857, p. 384. books.google.com. Accessed 10/31/18. Griswold, Helen Powers. Letter, 19 January, 1845. www.florencegriswoldmuseum.org. “Henry M. Onderdonk – Editor of the Hempstead Inquirer.” Friday 29 July, 2011. westhempsteadnowandthen.blogspot.com Accessed 9/29/18. Lowndes, Arthur. Archives of the General Convention, Volume VI, May, 1808 to February, 1811. New York: Privately Printed, 1912, pp. 456-468. books.google.com. Accessed 10/23/18. New York Daily Herald. 1 Jan 1845, p. 2. newspapers.com. Accessed 10/30/18. New York Herald. 5 January, 1845, p. 2. newspapers.com. Accessed 9/19/18. New York Daily Herald. 7 January, 1845, p. 2. newspapers.com. Accessed 10/30/18. New York Tribune. 27 June, 1844, p. 2. newspapers.com. Accessed 9/19/18. Onderdonk, Benjamin Tredwell. A Statement of Facts and Circumstances Connected with the Recent Trial of the Bishop of New-York. New York: Henry M. Onderdonk, 1845. cataloog.hathitrust.org. Accessed 9/19/18. Onderdonk, Elmer. Genealogy of the Underdone Family in America. New York: Privately Printed, 1910. www.archive.org. Accessed 10/29/18. Protestant Episcopal Church of the United Staes, Court of Bishops. The Proceedings of the Court Convened Under the Third Canon of 1844, in the City of New York. New York: D. Appleton, 1845. catalog.hathitrust.org. Accessed 9/19/18. Richmond, James C. The Conspiracy Against the Late Bishop of New-York. New York: James C. Richmond, 1845. Project Canterbury. www.anglicanhistory.org. Accessed 10/30/18. Seabury, Samuel, D.D. Witness Unto the Truth: A Sermon Preached in Trinity Church, New York, on Tuesday May 7th, 1861. New York: Mason Brothers, 1861. books.google.com. Accessed 10/30/18. Trow’s New York City Directory, 1853-1861. catalog.hathitrust.org. Accessed 10/31/18. What a fascinating, moving & well researched story. What incredible research, and such an interesting look at a historical scandal! I especially love how you brought the Tredwells in at each stage, to remind us that they may have been present and affected! Thanks, Jackie! We can only imagine the Tredwell family’s reaction, but it must have been a huge blow! Your fascinating blog post raises so many issues that remain pertinent, Annie. The bishop seems to have been tried and convicted right from the start, both in the court of public opinion and by his peers, whose motivations are certainly suspect. From this distance, his guilt or innocence is immaterial, but his mistreatment is indisputable and something we need to be aware of in our own time. You’re exactly right, Roberta: the powers-that-be wanted him out, and they succeeded. They even managed, years later, to subdue any protestations on Onderdonk’s behalf. Very sad story!